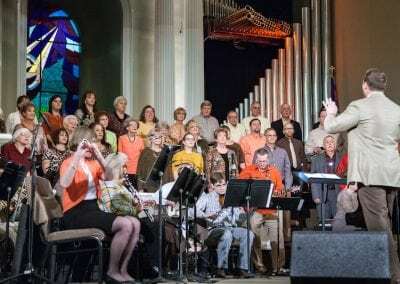 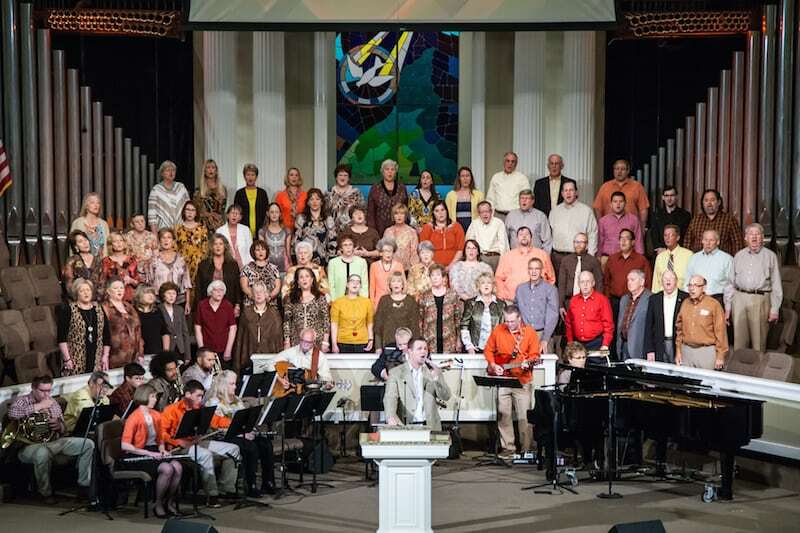 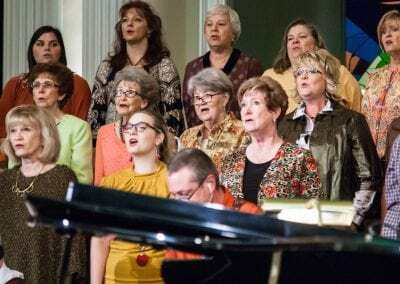 The FBC Worship Choir exists for the purpose of proclaiming the Gospel through song and leading our congregation in corporate worship each Sunday. 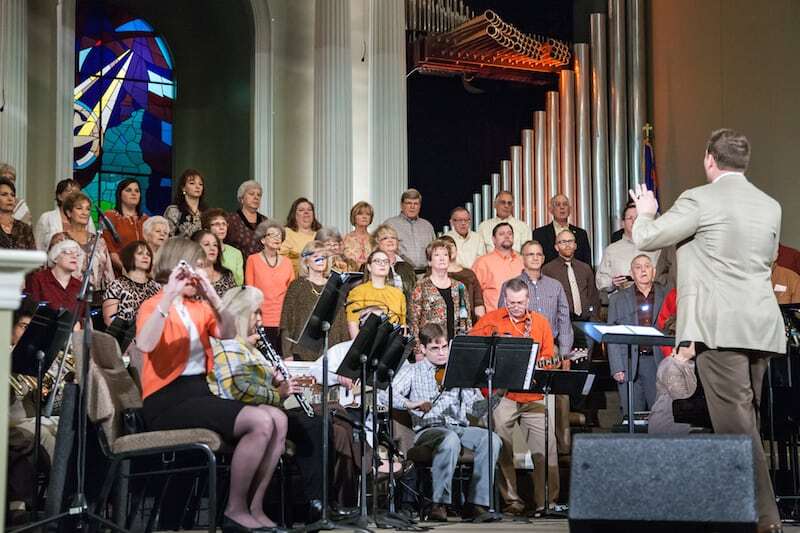 We strive to bring the Lord our best and to lead with a heart of humility and faithfulness. 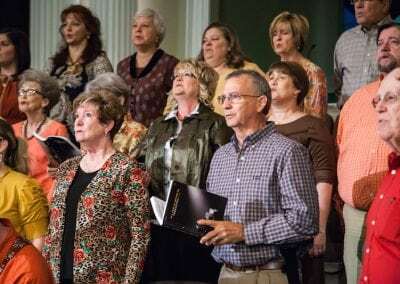 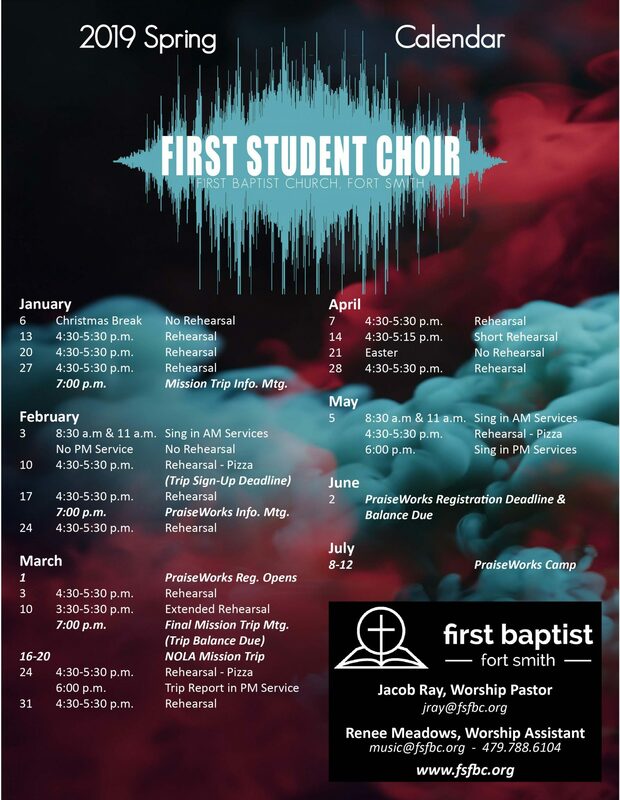 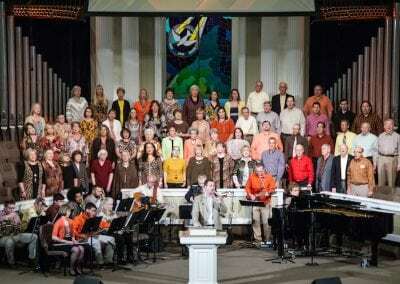 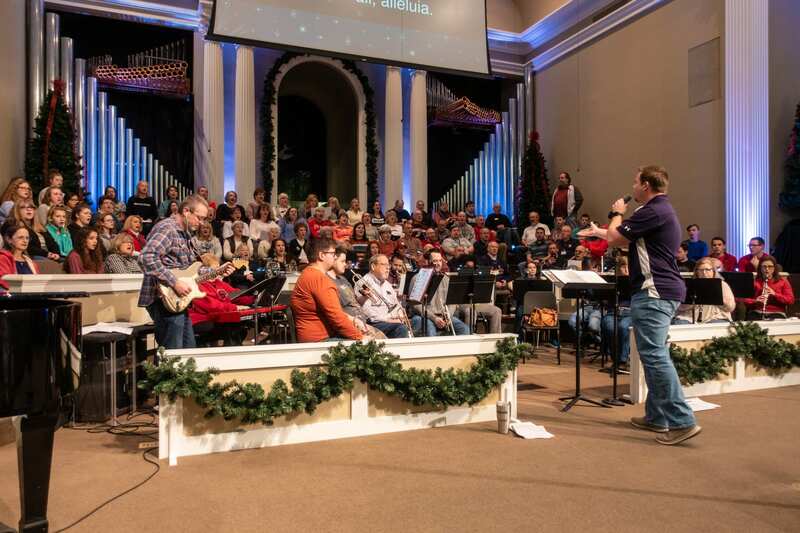 The FBC Worship Choir is open to all those who attend First Baptist. 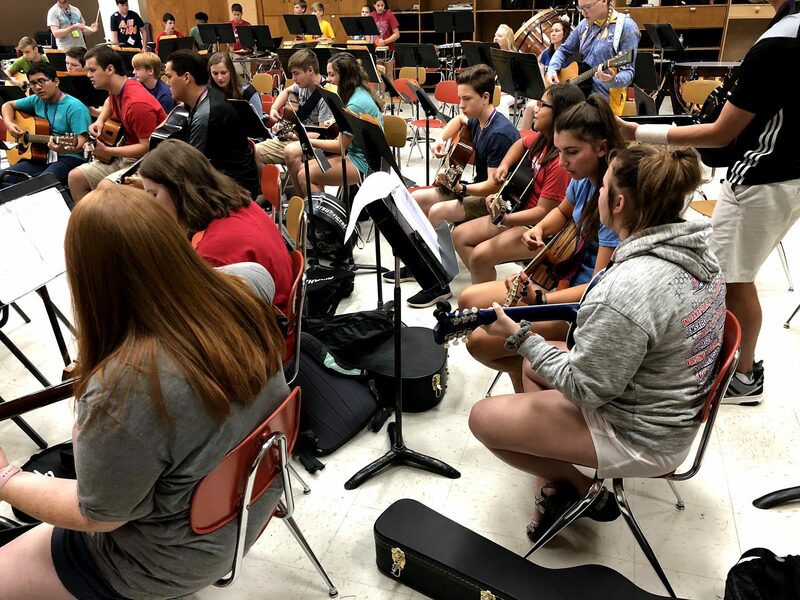 Call the Music Office at 479-788-6104 or send us a message below. 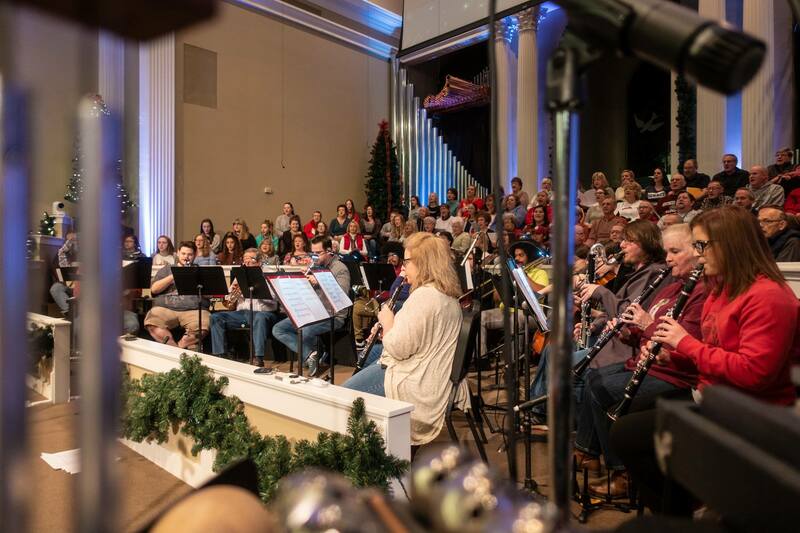 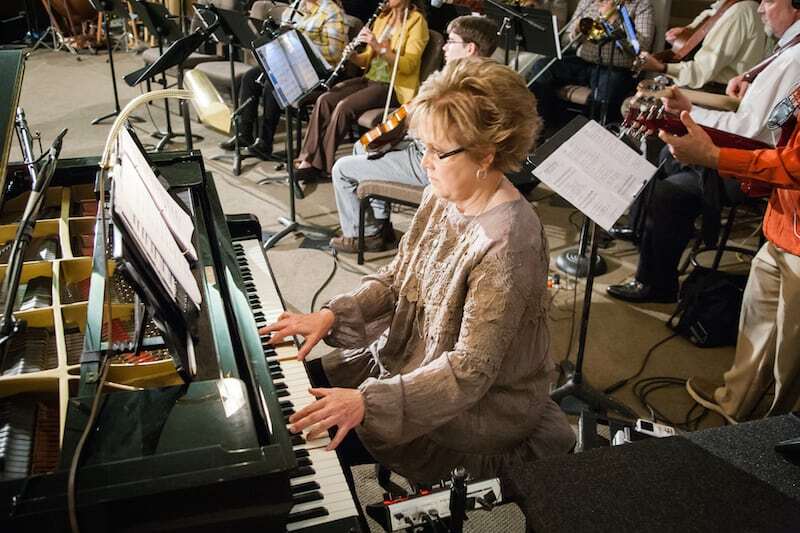 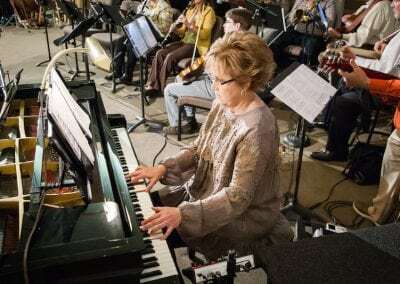 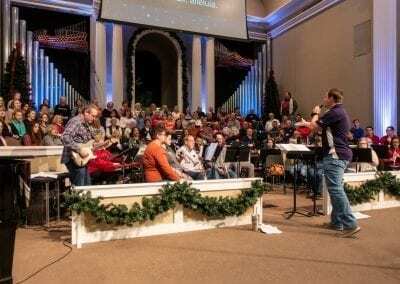 The FBC Orchestra is made up of musicians who love to use their skills to glorify God and to lead our church in worship. 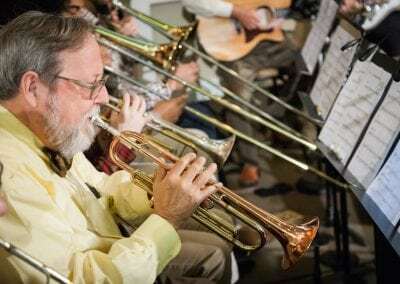 We are always looking for strong players to join with us. 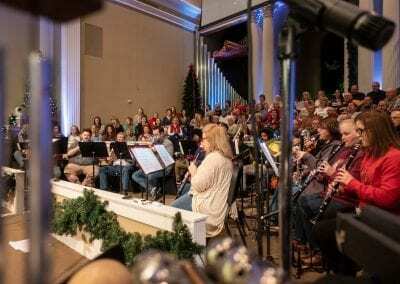 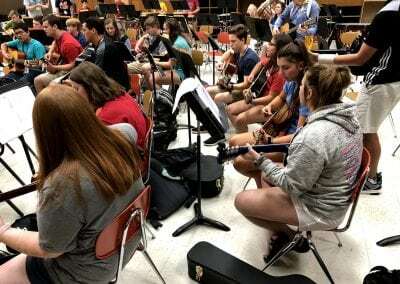 The FBC Orchestra is open to those who attend First Baptist and who have at least a high school level playing ability. 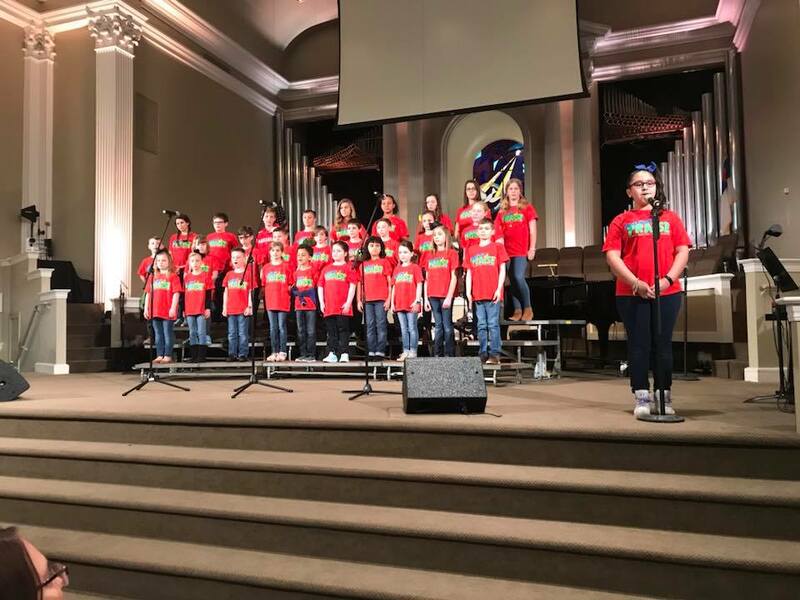 The First Student Choir consists of students in the 7th-12th grades who love to praise and glorify our Lord and Savior Jesus Christ through song. 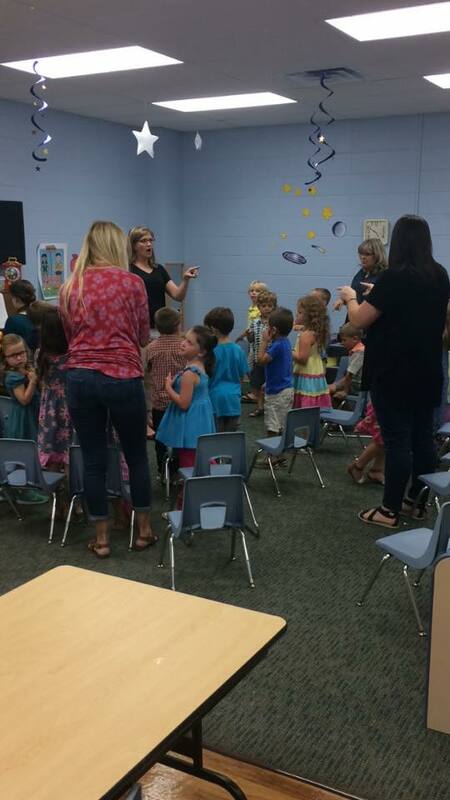 Our goal is to develop them into lifelong worshippers. 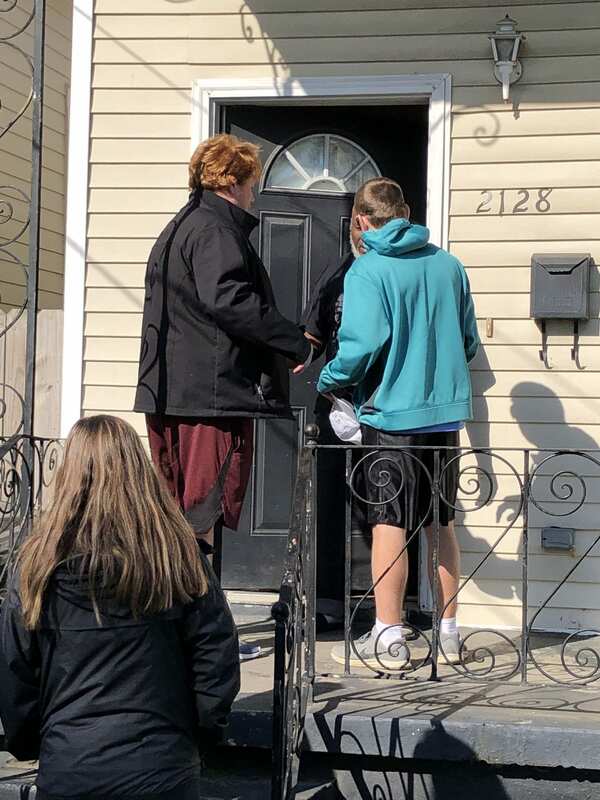 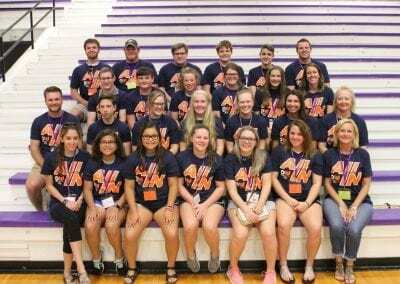 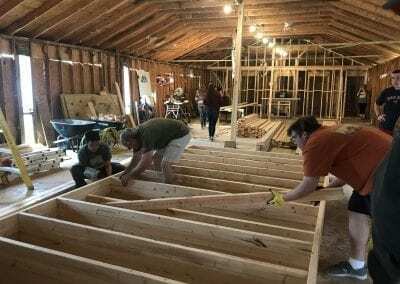 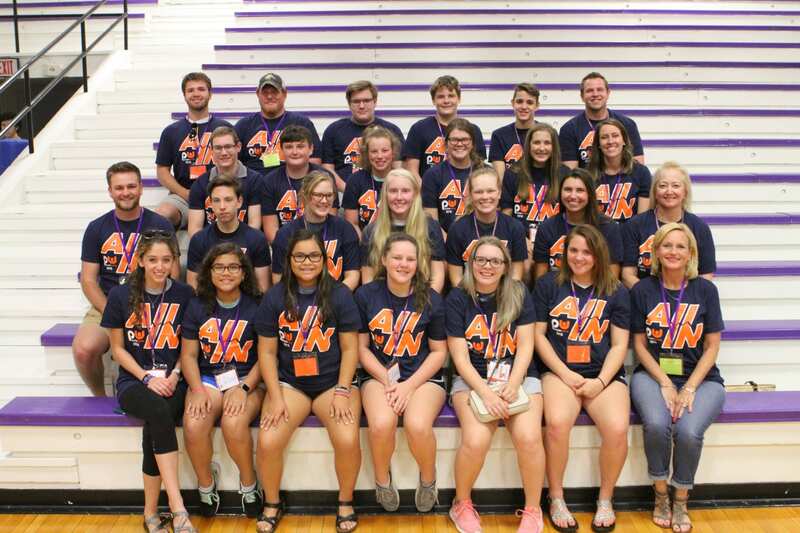 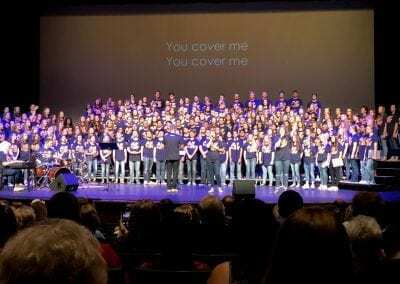 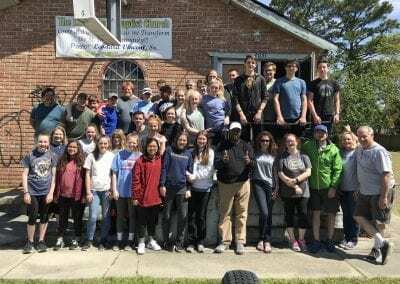 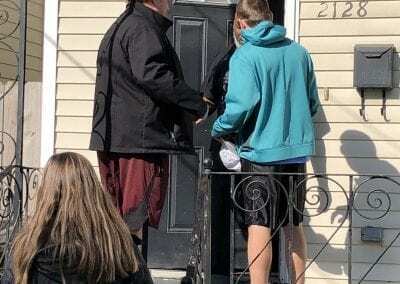 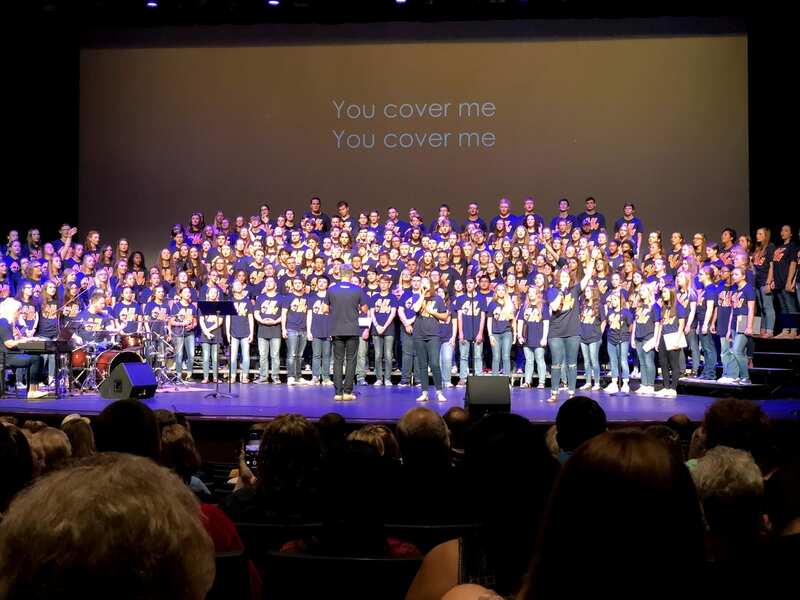 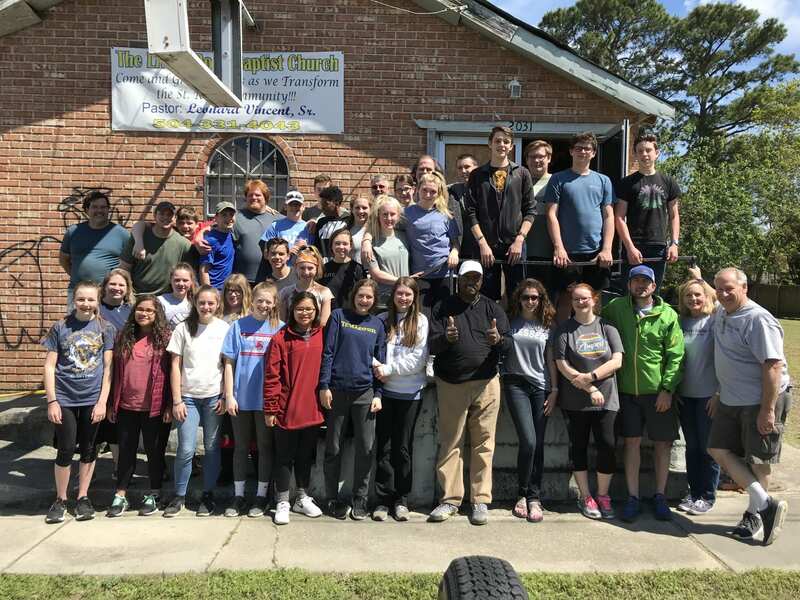 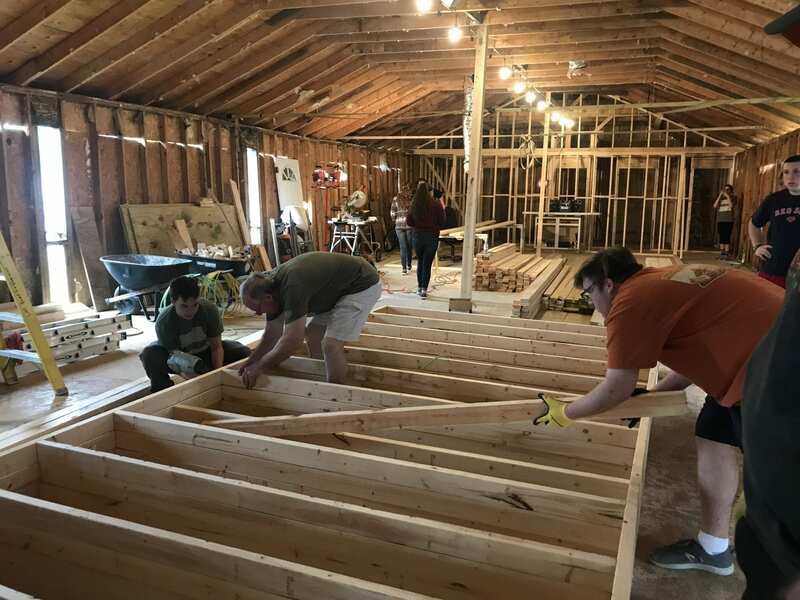 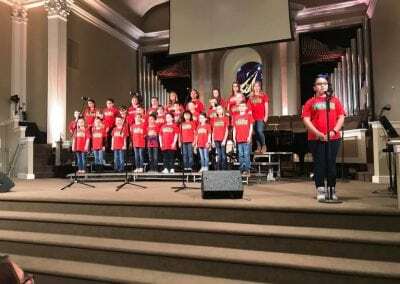 The student choir sings and leads worship in our church services multiple times throughout the year, leads through song and service to others on a Spring Break Serve Trip, and attends PraiseWorks Camp in the Summer. 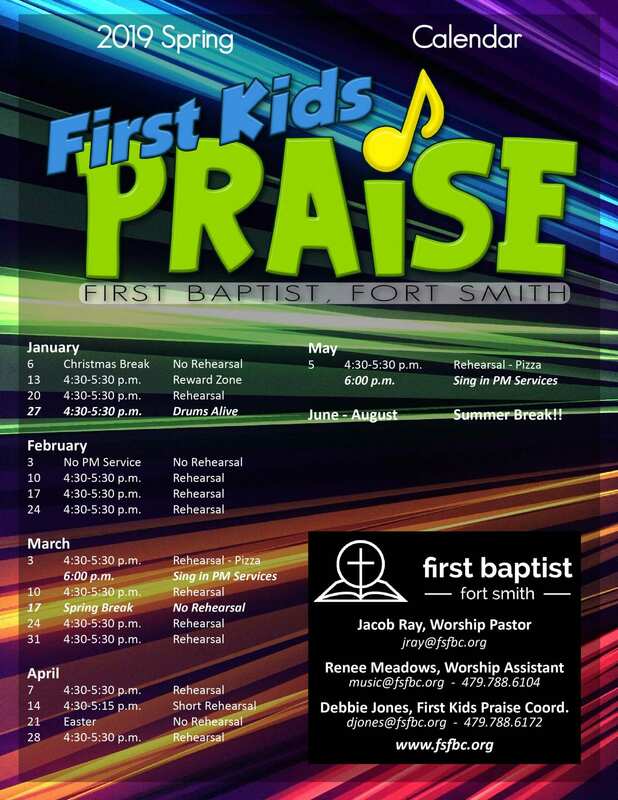 First Kids Praise is committed to sharing Christ’s love and helping our children worship the Lord through music. 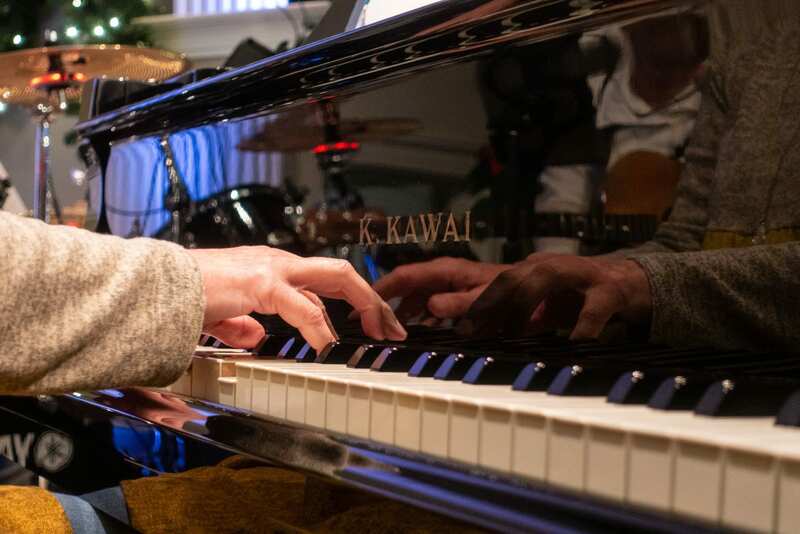 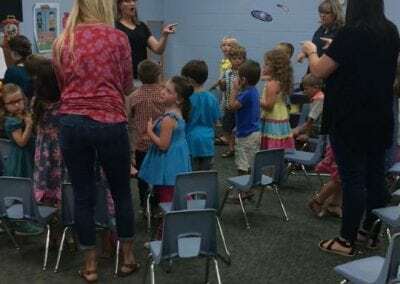 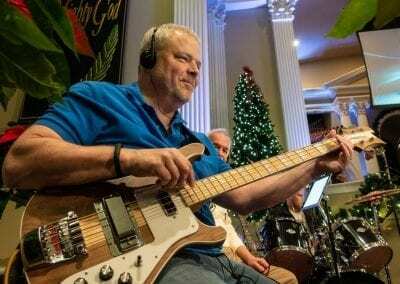 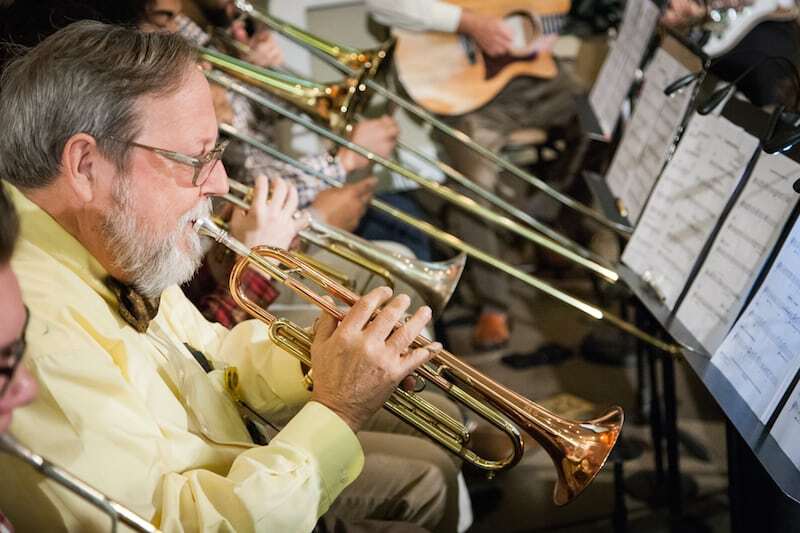 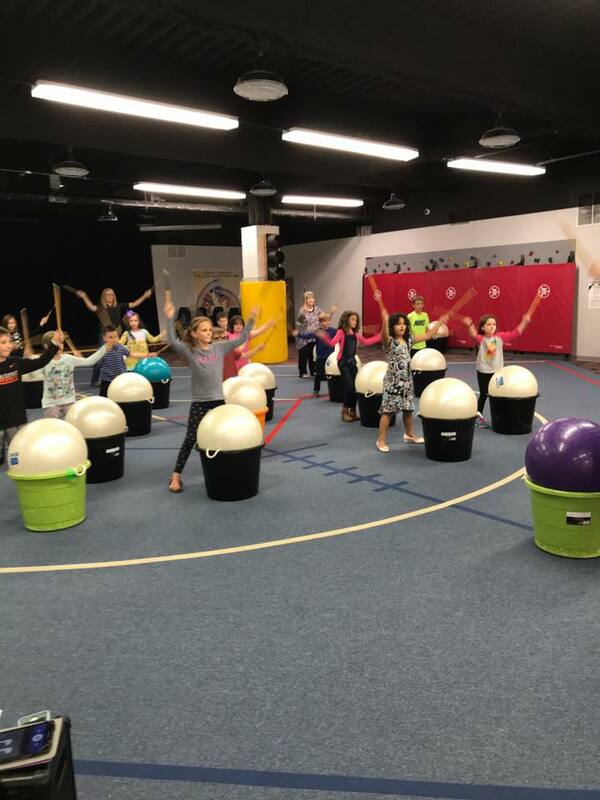 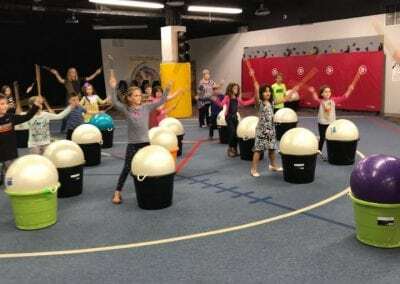 Our rehearsals are packed with high-energy and age-appropriate music as well as other games and activities that teach our kids about the love of God. 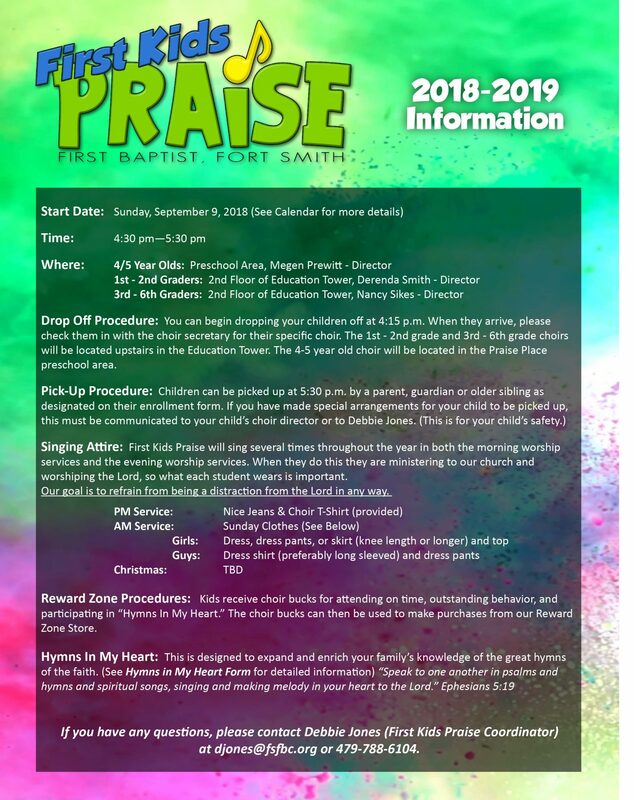 First Kids Praise is for children 4 years old through 6th grade and is divided into three different graded choirs. 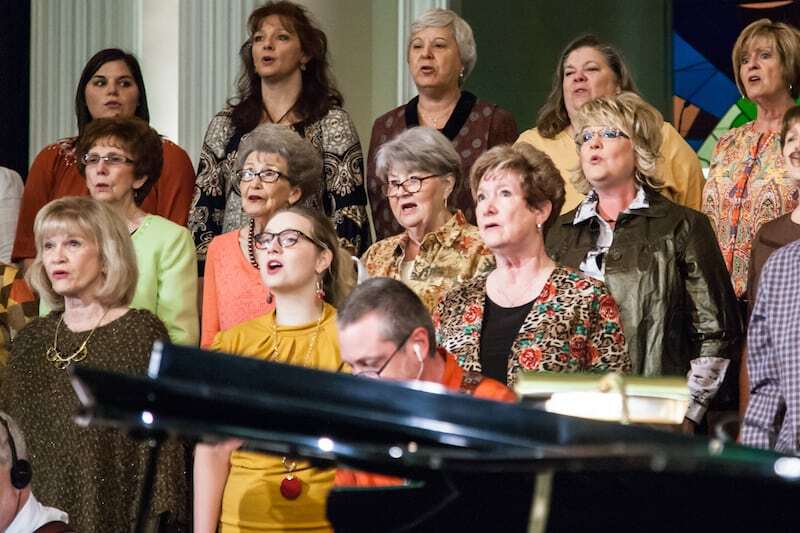 The choirs sing in church several times throughout the year. 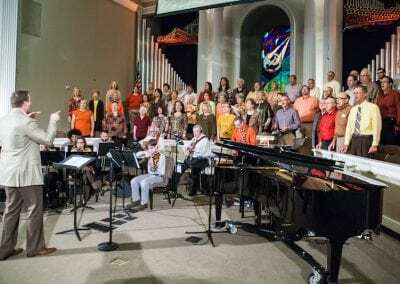 The FBC Bell Choir seeks to exalt our Savior through instrumental worship that is very beautiful and unique. 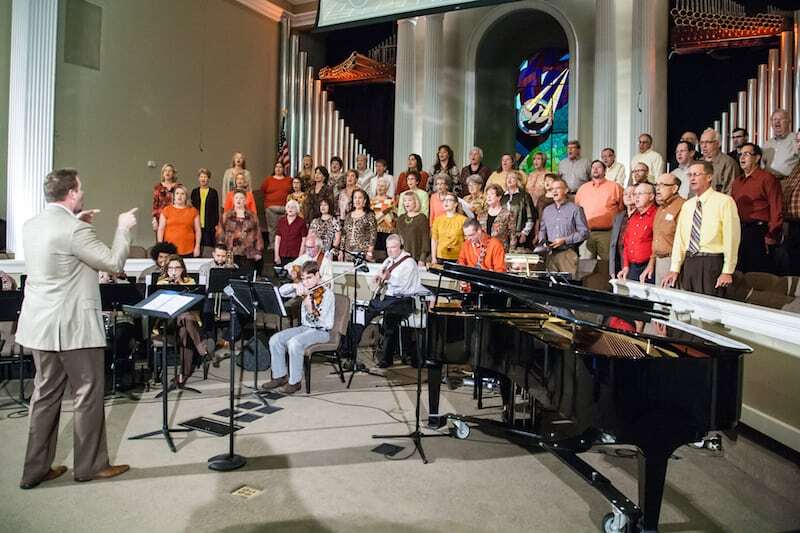 The bell choir plays many times through the year for offertories and special events at church and in the community. 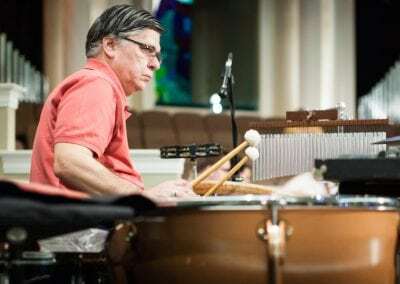 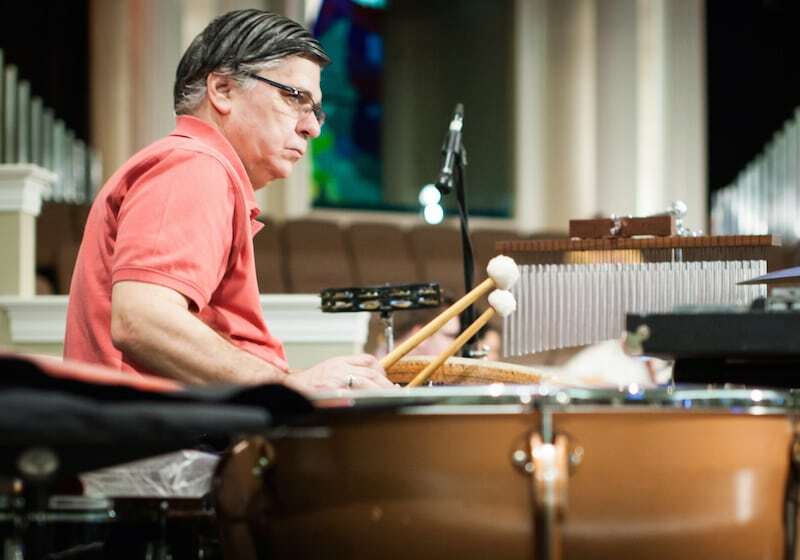 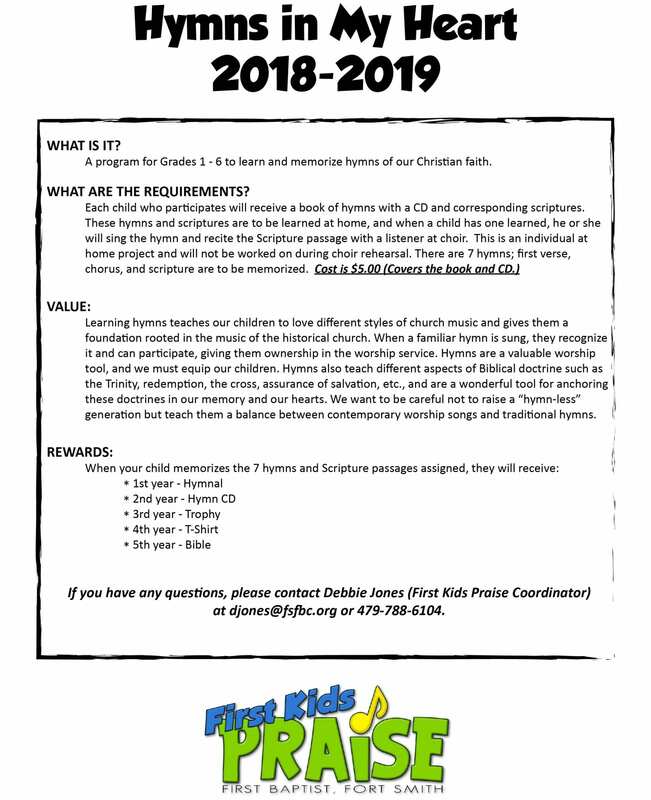 The FBC Bell Choir is open to those who attend First Baptist and who have a solid musical foundation. 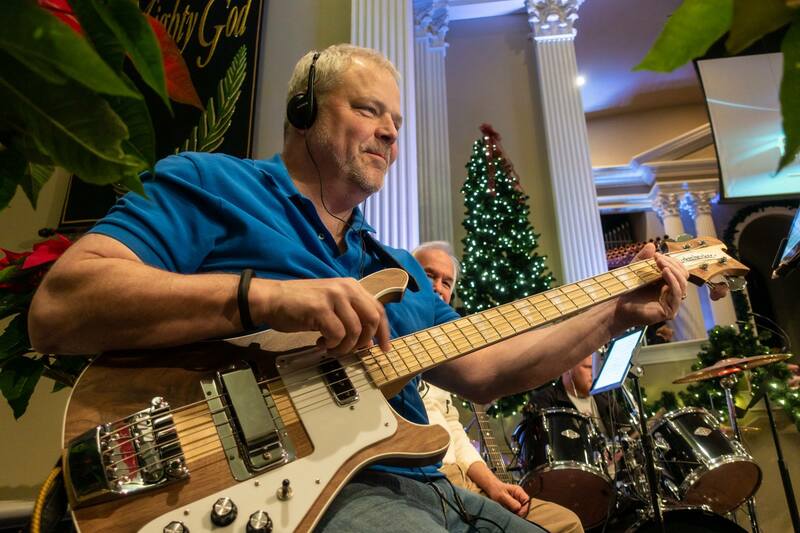 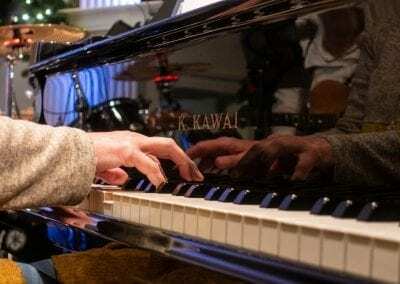 Upcoming Music Ministry Events & Info. 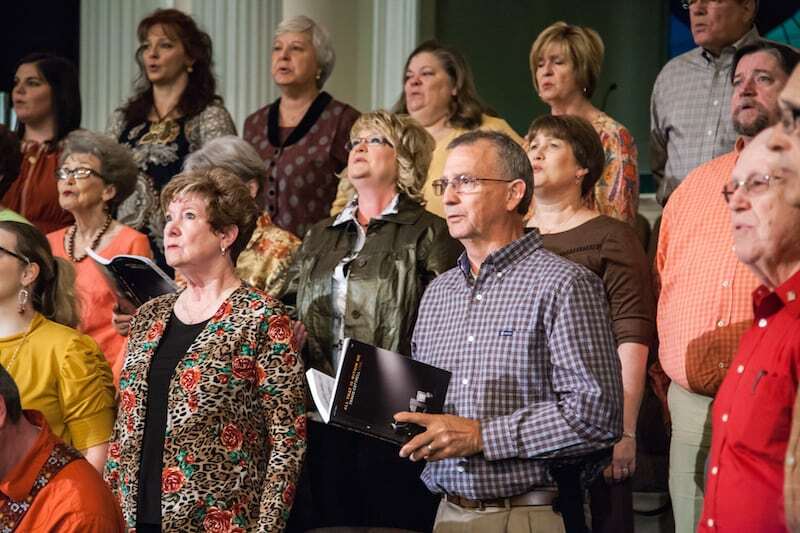 The FBC Worship Ministry will enjoy a Spring Fellowship on Friday, May 17th at 6:00 p.m. 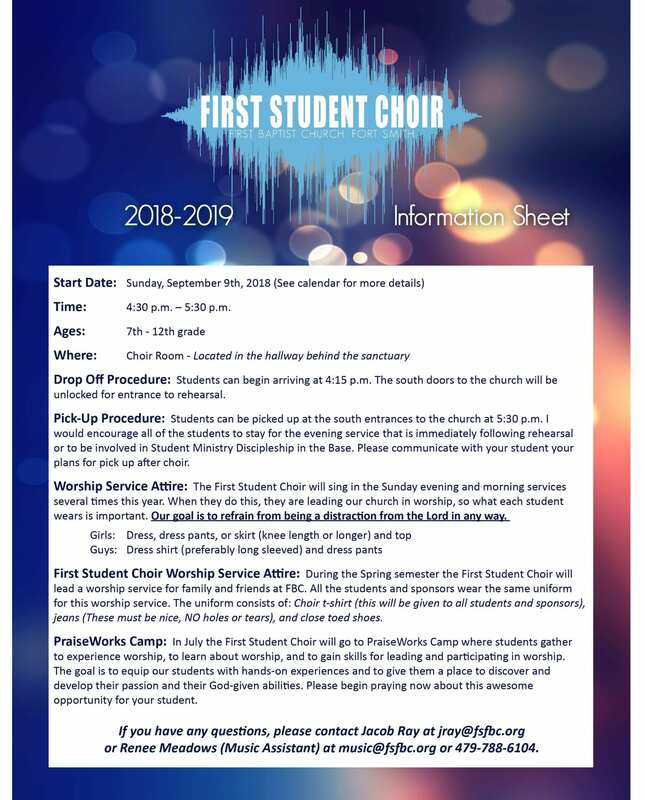 Please email music@fsfbc.org for more information.